The Srisailam Dam is constructed across the Krishna River on the border of Mahabubnagar District, Telangana and Kurnool district, Andhra Pradesh near Srisailam temple town and is the 2nd largest capacity working hydroelectric station in the country. The dam was constructed in a deep gorge in the Nallamala Hills in between Mahabubnagar and Kurnool districts, 300 m (980 ft) above sea level. It is 512 m (1,680 ft) long, 145 metres (476 ft) maximum height and has 12 radial crest gates. It has a reservoir of 616 square kilometres (238 sq mi). 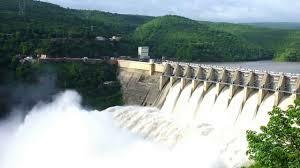 Project has an estimated live capacity to hold 178.74 Tmcft at its full reservoir level of 885 feet (270 m) MSL. The left bank under ground power station houses 6 x 150 megawatts (200,000 hp) reversible Francis-pump turbines for pumped-storage operation and the right bank semi under ground power station houses 7 x 110 megawatts (150,000 hp) Francis-turbine generators. Spill way gates Number : 12 Nos. River Sluices Number : 2 Nos.